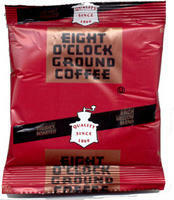 Eight O'Clock Office Coffee. This is a nice blend of quality and price. Comes in a 42 count case of 1.25 oz packages. Filters for a commercial coffee brewer are also included.